Who signed off on these Snow White apple snacks? Look, we're all for healthy treats (eat your snozberries kids) but everyone at io9 is firmly against magically poisoned apple snacks. There just aren't enough glass coffins for everyone. Supply and demand. But seriously, Snow White Apple Snacks? What? 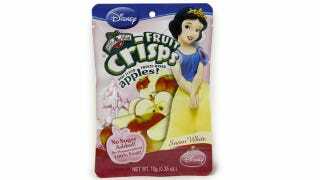 Disney is selling a bunch of healthy, sugar free dried fruit snacks. And that's great. Each princess has a fruit that matches her... persona? Cinderella is a pear, Belle is a banana and a strawberry (clearly representing the odd but delicious pairing of beast and book worm). But where they lost us is with the Snow White apple snacks.